Chromatic aberration is caused by the variation of the refractive index with the wave length. Therefore, there is no chromatic aberration when monochromatic light is used. The world is poly chromatic; hence, the human eye suffers for chromatic aberration. We can divide chromatic aberration into two sub catergories : longitudinal and transverse. Longitudinal chromatic aberration: for a simple depiction, a (non real) symetrical and rotationally symetrical eye is sufficient (the pupil is also centered). Longitudinal chromatic aberration in a simple eye model : for better visualisation, the respective paths of the green and red components of a polycrhomatic source are shown separately. Red light is focused behind the green light. This causes the spread of the red light to be larger at the retinal plane if the green is in focus. The point source is poly chromatic, and on the optical axis (which is coincident to the visual axis, owing for the symmetry of the eye). For clarity, the figure has been spitted in two, to show the respective paths of green (shorter wavelengths) and red (longer wavelengths). For this centered eye and an « on axis » point of fixation, longitudinal chromatic aberrations causes a « spread » of the focal spot. In this example, when green wavelengths are in focus at the retinal plane (top), red wavelengths are focused behind the retina; the eye as « less vergence » (less optical power) for the red wavelengths. This is due to the fact the refractive index decreases when the wavelength increases (red lightwaves are longer – less energetic- than green light waves). 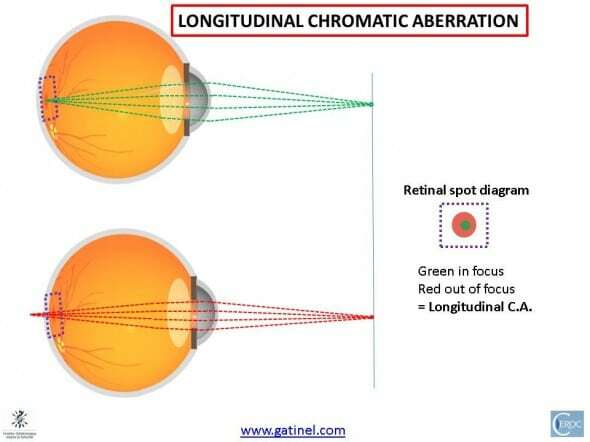 In thoery, optical calculation show that between the two ends of the visible spectrum, there are 2 diopters of longitudinal chromatic aberration (LCA). In practice, the effect of LCA degrades the optical quality of the eye in the same proportion as 0.2 D of monochromatic defocus, the human eye being most sensitive to yellow light (yellow light is in the middle of the spectrum). 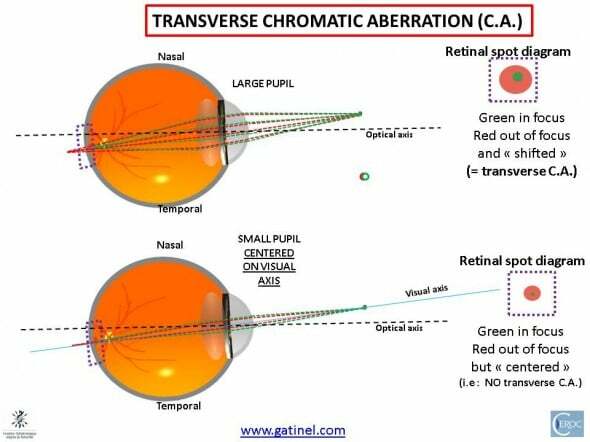 Transverse chromatic aberration is caused by the same physical mechanisms than longitudinal chromatic aberration, owing to the fact that the eye has non centered refractive surfaces, and an aperture stop (iris pupil), which is not centered on the visual axis. Transverse chromatic aberration is due to the absence of rotationnal symmetry of the eye. It is reduced by aligning the poly chromatic source on the visual axis (bottom). These asymmetries explain that the spot diagram of multiple wavelengths emitted by a polychromatic source are not in focus, and that the respective contours of these spots are non concentric. However, it is worth noticing that for rays traveling close to the visual axis, the transverse chromatic aberration si low (being zero along the visual axis, which can be defined as the axis of null transverse chromatic aberrations). In fact, the visual axis can be defined as the axis where the transverse chromatic aberration is null. The visual axis is sometimes called the « achromatic axis ». 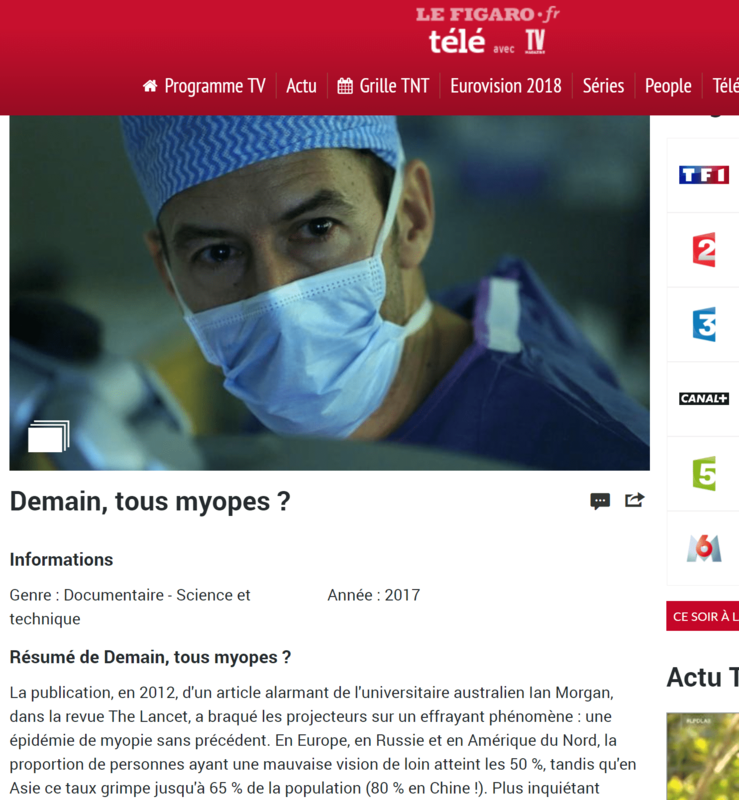 Consequently, it is important to center refractive surgical procedures on the visual axis, especially when they incur a reduction of the functional optical zone; if, not, the contrast of the retinal image will be severely degraded by large amounts of transverse chromatic aberration. The difficulty of achieving proper centration on the visual axis explains why it is difficult to correct the chromatic aberration for the human eye; any apparatus which would aim at compensating for LCA (ex: achromatizing doublet) must be well centered on the visual axis, to avoid the induction of large amounts of transverse aberration.